POSTCARDS FROM THE EDGE. Seattle’s image has many facets, most of them good, but its branding needs a sharper edge to be effective. 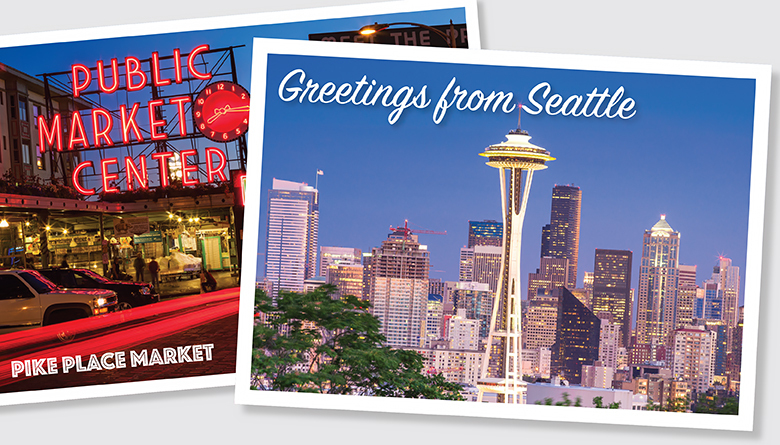 Mention Seattle to a stranger and you get a range of responses: Pike Place Fish Market. Starbucks. Amazon and Microsoft. Boeing. The Space Needle. Seattle is many things to many people. While overall perceptions are positive, these responses have one thing in common: They’re nouns, not adjectives. And that’s a problem when it comes to Seattle’s brand. In other words, Seattle is branding itself with a dictionary. It needs a thriller instead. Seattle-based market-research agency Lux Insights recently surveyed 660 people nationally, asking them to evaluate Seattle and seven other major cities on several brand-related attributes. The other cities are New York, New Orleans, Las Vegas, Los Angeles, Denver, Chicago and Austin, Texas. The study also set out to identify what specific signals Seattle is sending as it seeks to carve a distinct image. The conclusion? The city is viewed as having a positive, innovative business climate with countless strong attributes, but falls short on a key brand area: experience. The survey found that 80 percent of nonresidents believe Seattle is a major business hub. Seventy percent think the city is a leader in tech. Seattle also is viewed as cutting edge: 71 percent say it pushes the boundaries of innovation and 74 percent say it inspires change. On a more personal level, 86 percent say the region is beautiful and 74 percent view Seattle as an important center of culture. Seventy-six percent give it a thumbs-up for education and 76 percent for transportation. Seattle’s area of weakness is on experience. Compared to the seven other cities, Seattle scores second-to-last on “exciting,” at just 22 percent and “fun,” 19 percent. Cities such as Las Vegas and New York build their brands on excitement and fun, and their economies reap the benefit. Moreover, a paltry one-fourth of survey respondents said Seattle is inspiring and only 23 percent describe it as vibrant. Only 36 percent view the city as an “enjoyable” place to live or visit. When it comes to image, Seattle does better comparatively but could also use some work: Only 33 percent of outsiders say Seattle is trendy and just 34 percent say it’s charming. To put this in perspective, Seattle scores about as well as New Orleans on trendiness but falls far behind New York and Los Angeles. As businesses continue to set up shop in Seattle, quality talent is being tempted by promises of excellent employment in a beautiful city. But with only half of Americans agreeing that Seattle is a great place to live, it might take work to encourage them to put down roots here. And Seattle? The Emerald City. Sounds pretty, but not terribly riveting. Thankfully, Seattle’s brand rests on more than fishmongers or coffee. But what’s our story? “There’s something special happening in the Pacific Northwest and this region in particular, but what’s the old advertising adage? If you’re not telling your story, someone else is telling your story,” McGowan says. While Seattle doesn’t have the Strip, Broadway, or Mardi Gras, it can still carve its own space by encouraging, supporting and promoting unique Seattle experiences to help shape our national image and our brand. It may come down to focus. Maybe Seattle’s brand identity is uniquely titillating and buried somewhere in its history, waiting to be rediscovered. Amazon, Costco, Microsoft, Starbucks and Nordstrom are among the most “intimate” brands in the United States because of the bonds they create with their customers, according to a survey from New York branding agency MBLM, further cementing the Puget Sound region’s reputation as a retail mecca. Amazon, the world’s largest online retailer, ranked No. 3 in the survey, which queried 6,200 consumers in the U.S. and thousands more in Mexico and the United Arab Emirates. Thirty-two percent of Amazon users say they “can’t live without” the brand. Costco ranked No. 22, Microsoft No. 33, Starbucks No. 34, and Nordstrom No. 59. Disney was No. 1 and Apple ranked No. 2. MBLM says top intimate brands are more profitable and have double the number of consumers willing to pay 20 percent more for a product. Commercial brokerage Jones Lang LaSalle recently listed Seattle as one of North America’s prime urban retail corridors, specifically citing downtown’s Rainier Square project at 1301 Fifth Avenue as a development worth watching. It will deliver about 1.7 million square feet of office, retail, hotel and residential space when it opens in 2020.